You know what they say, right? Another day, another crafty tool to covet? Well I decided to splurge last week on a 48-count box of Zig Clean Color Real Brush markers and holy paint balls, I am so glad that I did. The card I created above was the result of just playing around with the pens and I was so geeked by the results, I decided to record a video showing you how three markers can make an elegant card and also make it look like you actually know how to paint. It may surprise you to know this but I do not technically paint. I do not draw. I’m a graphic designer who relies on computer tools to make stuff look good, but during the past year that I have been immersing myself in the world of card making, the creative discovery that I actually can do stuff I’d previously deemed off the table has been a really joyful experience for me. And these pens are the shizzzzzz. Here is a video showing you the basic process I used to create this card. Consider this a non-professional tutorial on using these markers. All supplies shown in the video can be found at the bottom of this post! If you want to splurge on your own set, I present this chart for your swatching pleasure. Just download the PDF and print it out on some watercolor cardstock. I used Tim Holtz’s brand, because it’s already cut to 8.5 x 11 and it worked beautifully on my ink jet printer. Just click on the image below to begin the download. Note: the file is zipped so if it doesn’t automatically unzip, be sure to unzip! Thanks for yet another really informative video Cathy! I started off card making in 2002 and no one has ever said to me warm your heat gun up first can you believe that?! As for your card it is truly beautiful. I started looking for some water colour pens just before Christmas, watched reviews and was keen on the Ecoline brush pens but couldn’t find a friend review. So impressed with your Zigs I went direct to watch another review – they are so fine I didn’t appreciate they were brushes rather than felt that can fray! Thanks as I think I shall be needing your colour swatch!! Now to find a good price. Hey Brenda! Try one or two out! I just figured I’d do a box of 48 but I get to write this stuff off for my taxes! 🙂 I’m glad I did, but I feel like wow, you get so much color from just a few pens! I’ve been looking around and here in the UK Amazon are by far the best price but I was being put off by some of the bad reviews about the condition they arrived in. Good to hear your take on it think I just need to be brave and order! I know that in the US, amazon will return any product you are not happy with! Oh, you! I wasn’t planning to buy these, but since I have the chart now…Yes, you’re that good! 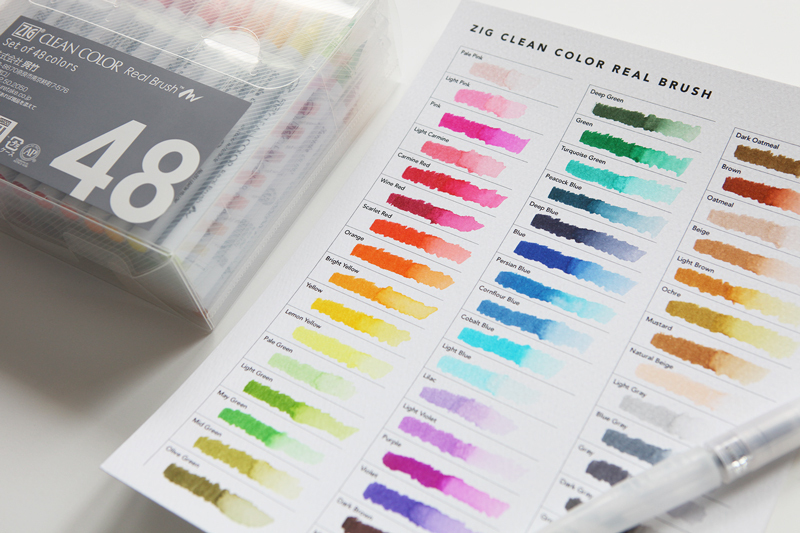 I’ve always liked Zig quality so I NEED these markers! Thank you for the lesson. Perfect timing for me as I’m frustrated with multilayer stamping right now. I’ve been a fan of yours back to the Simple Scrapbook and CKU days. 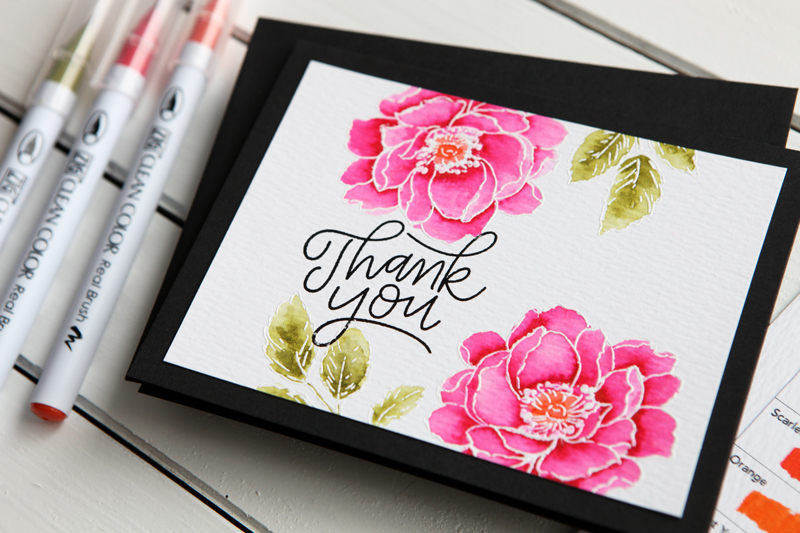 I was so happy to find you in the stamping community. Love your art and teaching style! Thanks, Donna! I am loving being part of this community! Cathy, Oh your card is beautiful! I love your cards because they are clean, elegant, and not so complicated that my stomach clenches up at the thought of me recreating one. AND I have both of these stamp sets, and the Zigs! 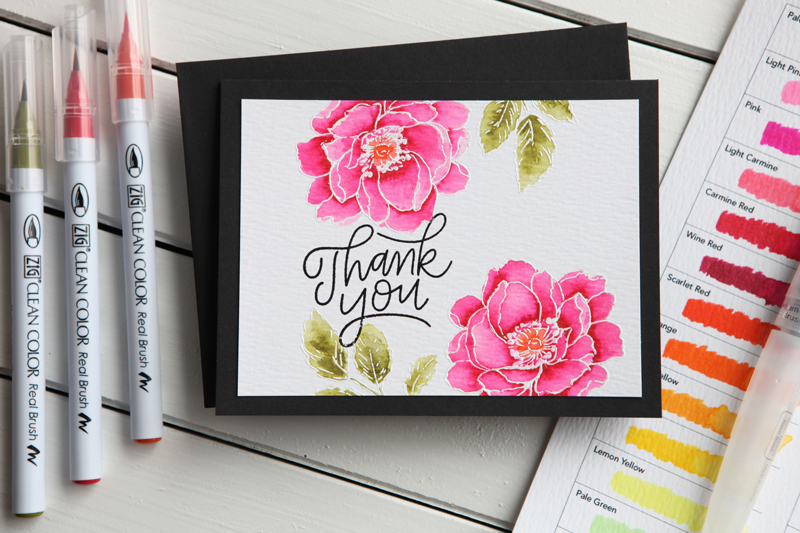 I got them right after I first started cardmaking, one year ago….I’m off to copy your card! Thank you for your video! YES! Do it, share it and tag me so I can see what you made!!! Thank you so much for the color chart. I received this set of markers as a birthday gift in April and I haven’t used them much. You have inspired me to get them out and start creating! I bought my Zig markers on Amazon several months back and they arrived in great condition. Thanks for another fun and informative video. I love how approachable you make the techniques seem. I’ve been following you in digi and enjoying your classes for many years. Nice to see you in the “card space” now, too. I’ve been making cards for a couple of years now, but still enjoy your fresh take on all of it. You actually emphasize a lot of basics that I think some of the other online card makers (who I love!) sometimes overlook because they’ve been in the craft so long. Thanks for the inspiration and fun! Glad you liked it, Lori! I’m trying to make videos that will inspire people to give it a whirl! Like I have said, I had NO idea this stuff was this much fun. Your card is beautiful! Thanks for the awesome video on coloring with these pens. I need to use mine more!! Thanks so much, Cathy, for another GREAT video! You never fail to inspire and your approach makes some daunting tasks seem so much more manageable. I have to admit that I’ve had these markers for a while but just couldn’t seem to achieve the beautiful results you did. Thanks to your video, I’m off to try them again. Thanks so much! Total enabler… now I need these, though I might not start with 48! Love the look you got. I’ve got to try these markers! Thanks Cathy for a wonderful and informative video. I will have to try this technique. I have the Zig brushes but have not used them. You make it look very simple with great results. Thanks for sharing your work. I have the set of 24 Zigs, and love them. I agree the Tim Holtz W/C paper is so nice to use. I usually use the smoother side, coward that I am. lol You do amazing work, especially for a newer stamper. Keep going, you are doing fantastic.